Eighty four years ago tonight – November 15, 1933. Four police cars converge on a small office building on Irving Park Boulevard in the Chicago Loop. In an upstairs doctor’s office, one of the most wanted men in the tri-state area is being treated for either a ringworm infection or “barber’s itch,” an inflammation of hair follicles, depending on which account you read. On the floor below, a cagey informant named Art McGinnis is signaling desperately to police that their quarry is upstairs. Fate, however, is on the side of the outlaw, a thirty-year-old bank robber named John Dillinger. “Look at all the police cars outside,” the physician observed. “I wonder what’s happened.” In an instant Dillinger was at the window and comprehended at a glance. The next instant, he was running down the stairs with a gun in each hand. Dillinger fired two shots as he stepped from the office, and his waiting companion started the car. Before the startled police understood what was happening, he had run across the street, jumped into the car, and discarded his pistols for a machine gun. Billie hurriedly backed into Irving Park Boulevard, ramming and disabling a police car waiting there, and headed east. By the time the police could take up the pursuit, the outlaw’s machine was traveling eighty-five miles an hour, and the slower Chicago squad cars were soon hopelessly outdistanced. Dillinger had broken the glass in the rear window, and his machine gun was returning the rain of lead from the police. Some of the above story may have been embellished on both sides… according to both John Toland’s The Dillinger Days and Bryan Burrough’s Public Enemies, Dillinger had noticed the trap as soon as he drove up and instantly hopped back into the car to speed the car away himself without ever firing a single shot back let alone a “rain of lead” from his Thompson. No matter what actually happened, the incident was one of many that transformed Depression-era desperado John Dillinger into a living legend who captivated the public through his multiple escapes and flagrant disregard for the law. The two had likely met about three months prior to their escape from the police trap, around late August 1933 when Dillinger was in the midst of his first bank-robbing spree, raising funds to bust his friends from the Indiana State Penitentiary. Having recently moved to Chicago, Dillinger accompanied his accomplice Harry Copeland to a cabaret where Copeland introduced Dillinger – as “Jack Harris” – to his girlfriend Pat Cherrington’s friend Billie. Billie would claim she never forgot Dillinger’s first words. He was standing beside her at the table, looking down with that lopsided grin. “Hey baby,” he said. “Where have you been all my life?” They danced. Dillinger was polite, which was enough for Frechette. 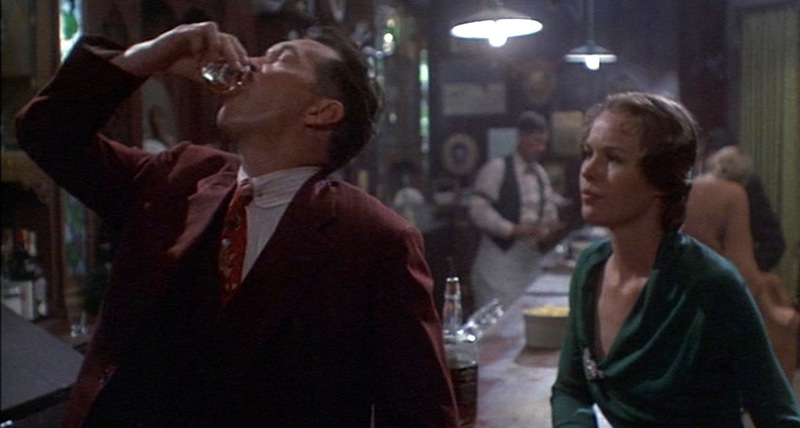 All accounts of Dillinger’s rather gentlemanly first encounter with Billie are considerably at odds with the couple’s anti-“meet-cute” in 1973’s Dillinger which finds Warren Oates’ version of the outlaw aggressively pounding shots of Jack Daniel’s at an Indiana road house while trading barbs with “dime-a-dance girl” Billie (Michelle Phillips, in her first film role.) The rest of the scene unfolds in a manner uncharacteristic to the real couple as Oates’ Dillinger drunkenly fires his guns akimbo while impulsively robbing the joint, then violently absconds with Billie to his gang’s motel hideout. Warren Oates’ John Dillinger has a penchant for brown suits, wearing a variety of earthy suiting for his string of bank robberies from Indiana to Iowa. 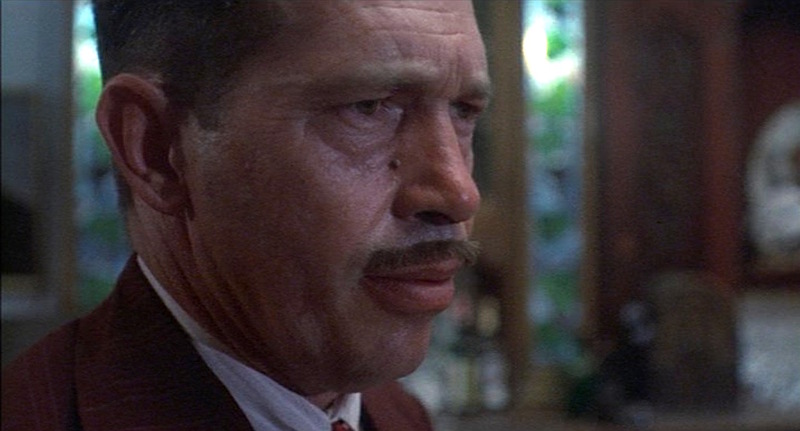 For this night of drinking alone in an Indiana roadhouse, Dillinger sports a warm russet brown three-piece suit with subtle triple stripe sets of gray, rust, and gray. Dillinger’s single-breasted suit jacket has notch lapels and wide, padded shoulders that were characteristic of the era’s tailoring. The back appears to be half-belted with no vents, and his sleeves end with the same spaced, non-functioning two-button cuffs as we see on his other suits. His three-button jacket also has notch lapels, a welted breast pocket, and straight flapped hip pockets with a ticket pocket on the right side. Dillinger’s shirt is subtly striped with tan and white alternating stripes on an ecru ground. A gold pin fastens the narrow collar under his tie knot, and the double (French) cuffs are secured with round links. His tie consists of a Deco-style print of bronze leaves on a bold red ground. Billie is rightfully annoyed when Dillinger continues to hog every shot of Jack on the bar. The suit’s matching double-breasted, six-button vest is one of the most unique and period-specific aspects of the outfit. The wide peak lapels sweep across the torso with three rows of two buttons in a straight, rectangular formation, cut straight across the bottom. The single-breasted suit with notch lapels – paired with this dressier, vintage-styled type of waistcoat – would be revived the following year for Robert Redford’s period suits in The Great Gatsby. The trousers are single reverse-pleated like his others with side pockets and plain-hemmed bottoms. He wears them with suspenders (braces) that have brown leather hooks fastened to buttons along the inside of the trouser waistband. Over his waistcoat, he wears a large tan leather double shoulder rig with a holster under each armpit for his two 1911-style semi-automatic pistols. 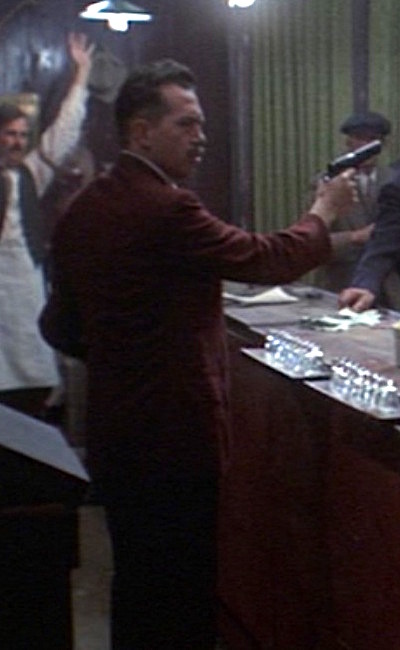 (Oates and his on-screen cronies carry the 9mm Star Model B rather than the historically correct Colt-produced M1911A1 in .45 ACP and .38 Super that was preferred by the Dillinger gang; this armament was typical in films of the era due to the difficulty of cycling .45-caliber blanks through a standard 1911.) The holsters connect over his back and shoulders with a series of dark brown straps. Dillinger’s double shoulder holster rig is best seen as he prepares to shave his Fairbanks-style mustache. Dillinger wears a pair of dark brown leather cap-toe oxford shoes, seen only when he is backing out of the bar with Billie. Believing himself to have proven his bravado to Billie, Dillinger takes the money he just robbed from the barroom denizens and scatters it onto the ground. 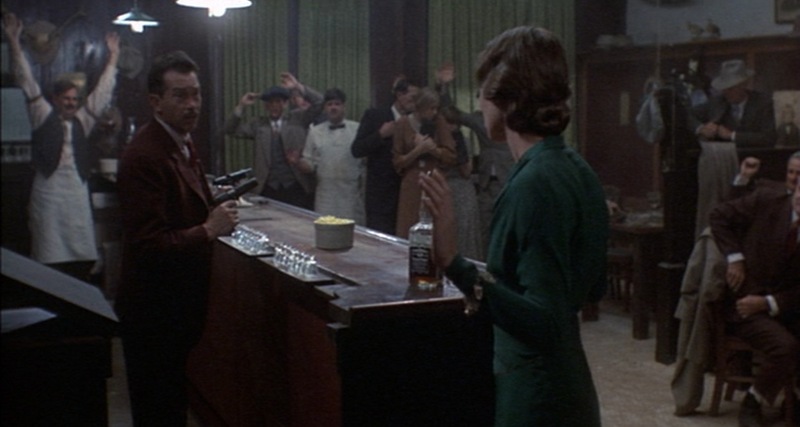 NB: As much as I appreciate Dillinger’s sartorial sensibilities in this scene, I abhor his behavior. Let’s make that perfectly clear! The scene opens with Dillinger steadily getting himself drunk while chatting up Billie, who makes more than a few references to his resemblance to mustached swashbuckler Douglas Fairbanks. In the background, we hear a vocal version of “Honey” recorded specifically for the film by Gus Levene and his Orchestra. The vocal version of “Honey” heard in this scene was arranged by Barry De Vorzon and shares many similarities with the song’s popular 1929 recording by Rudy Vallee and his Connecticut Yankees. Dillinger and Billie make their acquaintanceship over a bottle of Jack Daniel’s “Old No. 7” Tennessee whiskey, identifiable by its square bottle and the classic black label that the brand has used continuously since the early 1900s. 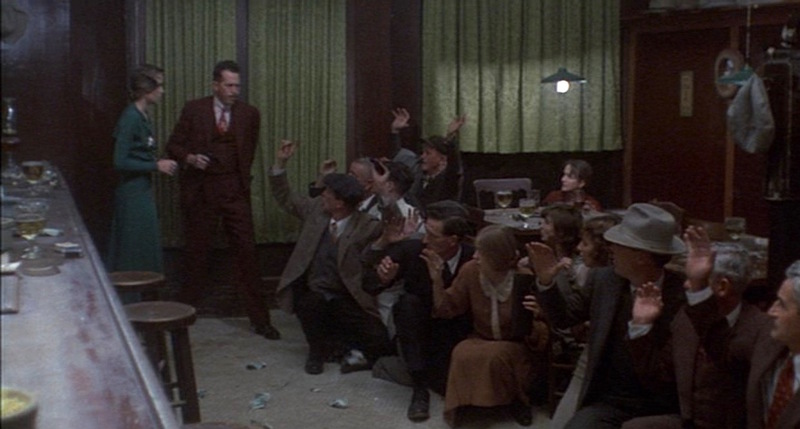 A boastful, impromptu bar holdup, uncharacteristic of the real John Dillinger. That said, it could be possible that this Indiana barkeep (whose hands are quite enthusiastically raised during Dillinger’s impromptu robbery) kept a pre-Prohibition bottle around as the brand was quite popular across the Midwest after taking home the gold medal for best whiskey from the 1904 St. Louis World’s Fair. The real John Dillinger “was a bit of a clothes horse, keeping his suits pressed and his hats blocked,” wrote Bryan Burrough in Public Enemies. 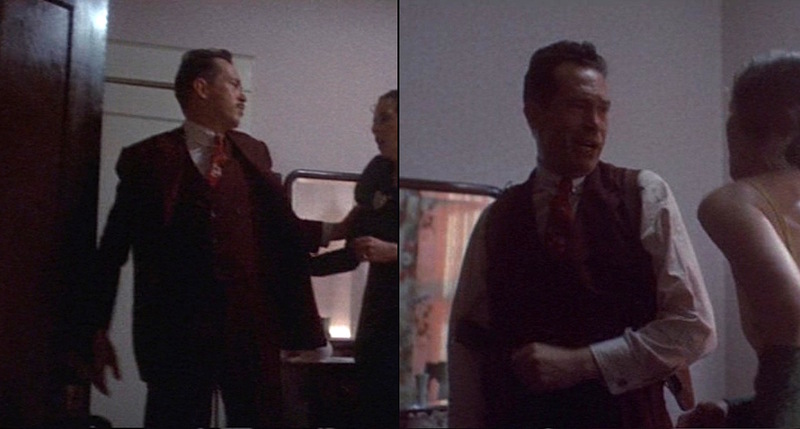 In fact, soon after he began living with Billie Frechette in the fall of 1933, Burrough reported that “Dillinger bought several new blue suits and a brown one,” and the latter color seems to be his suiting of choice in 1973’s Dillinger as Warren Oates sports one of his many brown three-piece suits when he meets Billie. 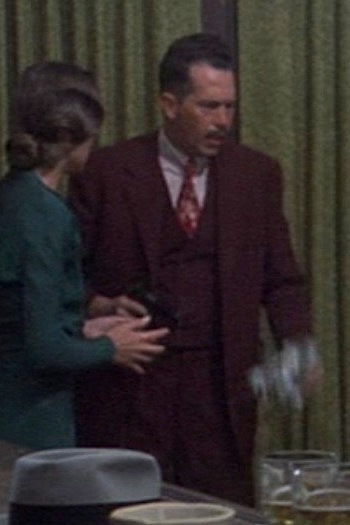 For as much as Oates’ Dillinger seems to take displeasure in being mistaken for Douglas Fairbanks, it’s interesting that his very 1930s-styled suit shares plenty of similarities with Magnoli Clothiers’ Fairbanks Suit… right down to the double-breasted waistcoat with its peak lapels, three rows of two buttons, and straight-cut bottom. The 2009 film Public Enemies stars Johnny Depp and Marion Cotillard as John Dillinger and Billie Frechette, respectively, and more accurately portrays their meeting over a slow dance in a Chicago nightclub.